Every site, like every person, is unique. Places are located by their position on a continent, in a country in a watershed. Sites are specific locations in longitude and latitude. Each location is a unique collection of the past, the present and the future of life. What was this place like…before? What animals and plants and insects thrived here? Who were the first people to pass through or live here? What did they do upon this land? Did they build shelters or homes? Did they grow food? Did they settle or did they move along? A site has dimensions and shape. It has high points and low points in relation to sea level. 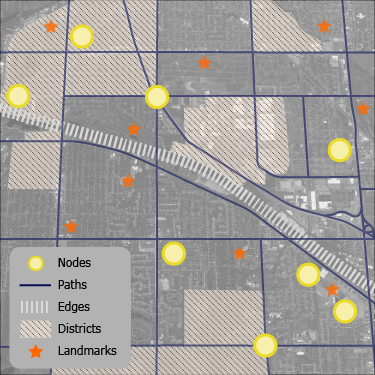 Site analysis involves the collection of physical information about a location’s archaeology, geography, geology, topography and climate factors. We look down and research everything we cannot see that lies below the surface. We look around and observe what exists. We look up and learn about its climate, precipitation, sunshine and wind movement. Experiencing a site happens over time in glimpses and fragments that selectively form images in our minds and eventually sensory memories. Architects photograph and annotate or put words to the photographic views. sketch (and choreograph the sketches), cognitively map (edges, nodes, landmarks, events) and revisit the site during design and construction. In this journey, experience a site of your choice and record what you have learned about it through the use of photographs, perspective sketches, found materials, and a cognitive mapping. Find a site that you would like to get to know better. It could be a corner lot, or a vacant lot or even a parking lot. Choose a lot on your school ground or between your house or your school in your community. Visit your site like you would visit a friend. Ask yourself, “ What will my site say to me today?” Carefully walk toward your site. Walk along its sides looking in. Walk into the site. Walk around the site on the inside. Look out of the site. Walk out of the site. 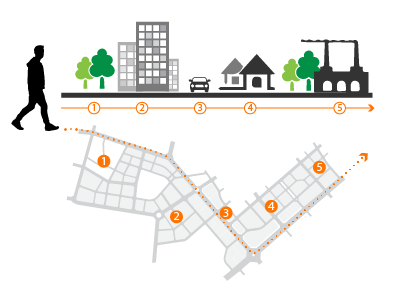 In this activity choose a site in your neighborhood (like your school or a vacant lot or underutilized parking lot) and collect material on the site. Look for gravel, grass, twigs, and human made materials. Consider how the material came to be there and what information about the site’s history and use you can learn from the materials you find. Collage the materials into a composition that expresses something about the existing state of the site. Draw your material collage. On this visit to the site, you should make perspective sketches looking into the site, looking out of the site and looking at views adjacent to the site. Spend 20-30 minutes on each view and sketch at least four views. While you are sketching you will hear the sounds of the site and feel the temperature of the site. Draw all four perspective views on one page of paper or scan your individual drawings onto one page. Label the direction of the view such as looking north, looking in, looking toward downtown, etc. Next label key buildings or elements that you have recorded in your view. Know you site and its surroundings! The same day you visit the site to collect materials and to sketch, take a camera along. Photograph the materials in place. Select key views as you walk toward, along, through and in and out of the site. 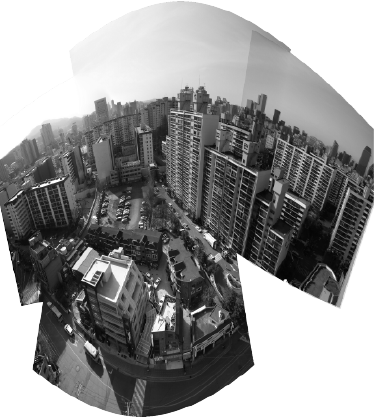 Take your photographs either as panoramas or make panoramas by overlapping single photos. Then analyze the photographs. What do you see? You can start by naming places like specific streets, buildings, or landmarks. You can name materials. Then associate those views and materials with content if you can. Do the materials show refinement or neglect? Do they show litter or care? Do the views contain neighborhood communities or specific types of buildings like a school, grocery stores, or office buildings? By carefully looking at a site, you are becoming more critically aware of your environment and more able to read its condition-past and present. This will help you imagine what your site could be in the future. You can post your pictures about your site on the site on History Pin or Google Maps. Now take the same site you have been studying and put words in different sizes (of importance) on the map so that someone looking at your graphics can read about the content of the site. For example, label key buildings such as schools, post offices, churches, etc. Label homes as individual homes or multi family homes or as a residential area. Label key physical feature such as rivers, lakes, ponds and parks. Let the words name the site and its surround. Sites are physical locations that are connected to larger earth, air and water systems. The sun is a source of heat (radiation) and light. Research sun angles and place the swing of the sun in the winter and the summer. Next, research wind direction, velocity and frequency. Wind affects cooling of built areas and space. Place a copy of the wind rose diagram to the right or left of your site map. Locate any key trees, shrubs, and planted areas. Walk the site and note the highest and lowest points. Research the amount of precipitation (rain, sleet and snow) that falls on your site. The frequency and amount of rain affects building forms and site drainage. Using your math skills, find the area of your site in square feet and multiply that by annual rainfall. If your site were a swimming pool, how much water would fill it in one year? Site programming and planning and design take into consideration this amount of water and create water elements to naturally collect, drain and filter the water. Show arrows that point in the direction of drainage or slope to the lowest point.Include a precipitation chart that shows the amount of precipitation each month. Locate your site within a watershed system. Next, find the wind rose for your zip code and map the directions of the wind when it is coldest and when it is hottest. Also include a temperature chart that shows the range from hot to cold. Connect your site to weather systems. Architects observe, study, research and document sites making cognitive and physical maps to communicate what can be learned from the site. In this activity you should print a satellite view of your site in black and white. Using a transparent overly and colored markers or pencils, mark key intersections (nodes), edges (or boundaries-soft, hard; positive, negative); fields (or areas). 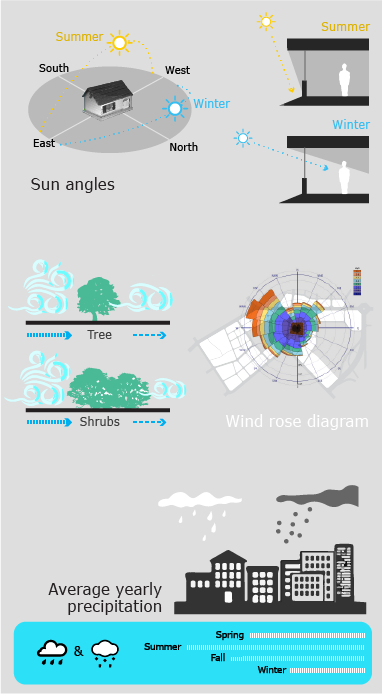 You have just made a cognitive map about the qualities and image of the site from an architect’s view. You can remake this map looking at the same topics just by studying an aerial view. Visit the site during different times of the day and (if possible) in different seasons. Find out who uses the site and for what activities. Observe whether the site in its current condition supports healthy activities or hinders people using the site. Mark +(positive) and negative (-) areas that exist. 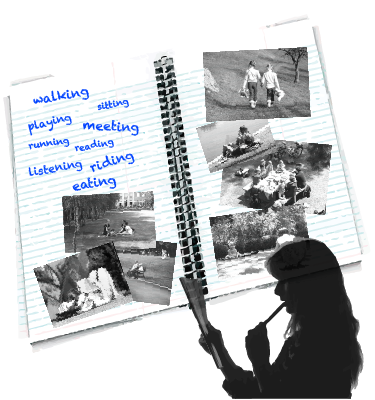 Make a list of activities and collect photos of people in these activities. Think about walking, sitting, playing, running, reading a book, meeting, etc. 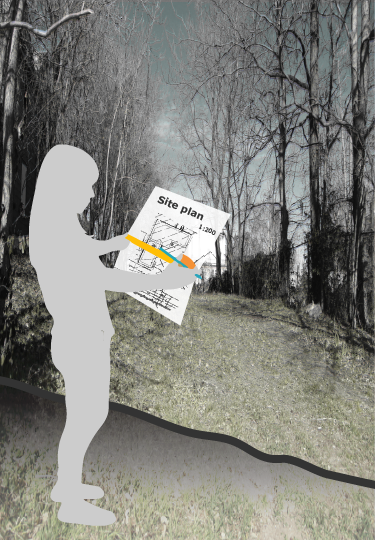 Make a second copy of the site plan map and mark the activity areas. Stack the series of activity pictures on the right with dashed lines to where the activity takes place. If possible you can interview users about the site by creating a short survey. Your survey can ask questions about when they use the site, what they like or don’t like about the site, and whether they feel safe and comfortable visiting and using the site. This visit to the site starts with a digital copy or satellite image of the site and some of the surrounding areas. Make a copy that fits onto an 8 ½ x 11 sheet of paper. Using trace paper or Google Scribble Maps, measure and dimension the width and length of the site. Locate and place a north arrow. Now with camera in hand, take pictures of any key landforms or built areas and place the photos on the side of the map in a column with dotted lands to their position on the plan. Draw a line across the site and another one from top to bottom. These are section lines or lines where you will cut through the site. 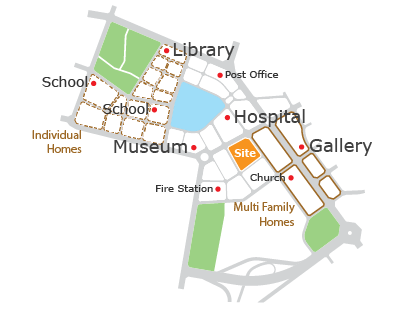 Draw 2 sections of the site at the bottom of your site plan and label them. Architects, engineers and landscape designers record the legal measurements of a site through a site survey. The site survey is extremely important because it defines the dimensions of the site, geometry of the site, contours (or elevations), major topographic features, and locates utility (electricity, water, gas, etc.). It’s location will also set its permissible land use (such as residential, commercial, industrial, etc.) through something called zoning. Your village hall will be able to tell you the zoning for your site. Who was responsible for overlay maps representing social and ecological values of land use? Which landscape architect opened the first professional Landscape architecture office in the United States? Who wrote Design with Nature in 1960? Do you think highways take into account the land, native vegetation and natural habitat regions? Discuss your answer in class and with your peers. Which contemporary firm looks at landscape as part of larger social, cultural, environmental and technological systems? All of the these firms do.